Congratulations to Associate Professor Patrick Alcedo (Dance) on the completion of his new film! A tribute to millions of Filipino foreign domestic workers, A Piece of Paradise is an intimate portrait of three Filipina women as they persevere to build their lives as immigrants and foreign domestic workers in Toronto, Canada. Norlyn, a personal support worker for a lady suffering from Alzheimer’s disease, struggles to raise her son as a single mother. Her older sister Betsy, an employee at a jewelry shop, takes on various part-time jobs to make both ends meet. And Em-Em, a nanny to daughters of a rich Jewish family, saves her salary in order to send money back home to her parents and older sister in the Philippines. Shot in three countries over a five-year period, A Piece of Paradise patiently and transnationally follows the pains, joys, and hopes for the future Norlyn, Betsy, and Em-Em go through. While the film is focused on these incredibly resilient women, the camera zooms in as well on the teenagers Bimboy (Betsy’s son) and especially on his cousin Darrell (Norlyn’s son) who rejects his Filipino identity. Amidst their hardships, they find “pieces of paradise” through their participation in the annual Ati-atihan festival in honor of the Holy Child Jesus; the maintenance of their Roman Catholic faith; support from the Filipino community and their friends and loved ones; and starting a new romantic relationship. In particular, Em-Em, who succeeds in petitioning for her husband to emigrate from the Philippines, finds hers when she gives birth to her son: baby Miguel. 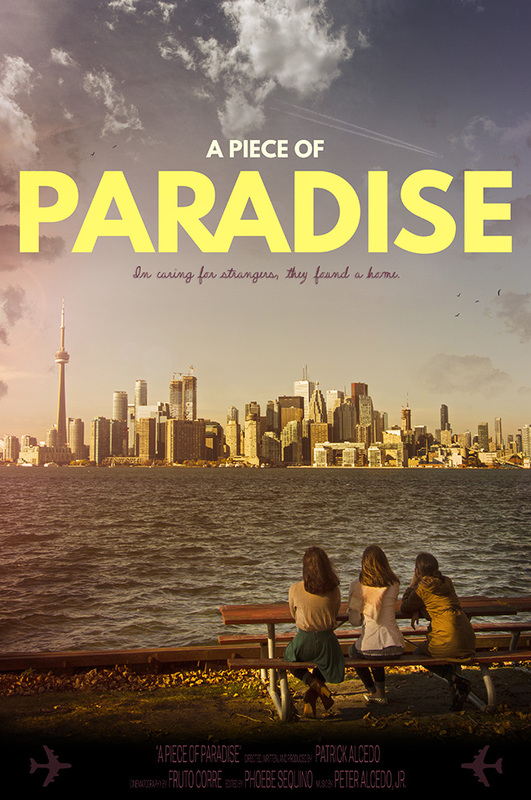 A Piece of Paradise is a film for anyone whose own life has been moved by immigration, religious faith, parenting, emotional labor, and desire for a home. Norlyn, Betsy, Bimboy, and especially Darrell and Em-Em are steadfast and inspiring companions in these complexly painful yet heartwarming journeys. A former Rockefeller Humanities Fellow at the Smithsonian Institution in Washington, D.C., Patrick Alcedo is Associate Professor in the Department of Dance at York University, Toronto, Canada. Born and raised in the Philippines, he holds a Ph.D. in Dance History and Theory from the University of California, Riverside under the auspices of the Asian Cultural Council. In recognition of his outstanding research and creative excellence, the Fulbright Association of American awarded him in 2014 the prestigious “Selma Jeanne Cohen Fund for International Scholarship on Dance,” and York University named him a year later a “Research Leader”. Among the many research grants he has won is Canada’s “Social Sciences and Humanities Research Council Research/Creation Grant” that supported the production of his feature-length documentary, A Piece of Paradise. Currently he holds the highly competitive “Early Researcher Award” from the Government of Ontario. This five-year grant has provided support for his training of Ontario residents and students in conducting research on and documenting on stills and video Philippine traditional dances as practiced in Canada and the Philippines. Recently his proposal to celebrate Canada150 through the staging of close to 20 Philippine dances and music, giving of public lectures, screening of documentary films, and launching of a website has received funding from the Office of the President of York University. As a dance ethnographer and cultural studies scholar, he is the author of several refereed articles on Philippine culture and public performances and the lead editor of the volume, Religious Festivals in Contemporary Southeast Asia (2016). As an artist, he is a performer, instructor, and re-stager of Philippine folk dance traditions. And as a filmmaker, he is the director, producer, and writer of 5 documentary films. Building on the film production he conducted last year in the southern island of Mindanao, Philippines and the country’s urban capital of Manila, he is scheduled to finish this year 2 additional documentary films. They are about an indigenous dance form that is to be nominated for UNESCO’s Intangible Cultural Heritage Representative List and about the disparate realities of two ballet dancers who are joined by their membership in a dance company but separated by extreme difference in class status and economic backgrounds. 2017 Dancing Manilenyos. Director, Producer, Writer. 15-min documentary film. 2016 A Piece of Paradise. Director, Producer, Writer. 120-min documentary film. 2012 Ati-atihan Lives. Director, Producer, Writer. 55-min documentary film. (distributed by Alexander Street Press <www.alexanderstreet.com>). 2012 Panaad: A Promise to the Santo Niño. Director, Producer, Writer. 18-min documentary film (distributed by Alexander Street Press <www.alexanderstreet.com>). 2012 Ati-atihan: Mother of Philippine Festivals. Director, Producer, Writer. 22-min multimedia of still images, music, and ambient sounds (distributed by Alexander Street Press <www.alexanderstreet.com>). 2009 Boxing in the Shadow of Pacquiao. Producer. New York Times, November 12.